Bench-mounted table which combines with a standard router to create a full-featured router table. Capable of shaping, planing, rebating, trenching, moulding, jointing and grooving. Easy tool-free configuration plus length and angle measurement scales. Includes protractor, non-latching switchbox, router trigger clamp, main fence, adjustable output fence, safety guard, 2 x vertical featherboards, horizontal featherboard, cast aluminium table, 2 x table extensions and dust extraction port. Includes full instructions and fittings pack for easy assembly. 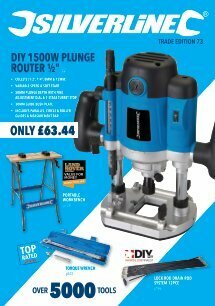 Suitable for 900-1800W routers with a base diameter of 155mm (6") or less. Fitted with UK 13A mains plug and socket. Biggest load of rubbish I have ever had the misfortune to buy. Made from thin tin sheet. Assembly instructions are printed so tiny I had to use a magnifier to ever attempt to read them. Design is also rubbish. My advise is avoid at all costs. I will be stripping it down to use the switch and maybe a few other fittings on a home made table. A good basic table that initially was a tad confusing to assemble but easy once I had the design in my head. Loctite the table bolts and they''ll stay put or fit nylon locking nuts. Easy to assemble. Sturdy and well made. Does what it is meant to do. Long guarantee so peace of mind for future. Very pleased. The first table that came was not level from front to back. When a spirit level was put on the table it rocked bac and forward. Also in the details of the router table there was no mention that the base of the router has to be 155mm or less. This Silverline DIY Router Table with Protractor is guaranteed for a period of 30 days from date of purchase against a fault developing in either the materials or the workmanship during manufacture. You can register for your 3 Year guarantee by registering your product online. Any faulty goods will be repaired or replaced free of charge.